Carrickfergus rider Alastair Seeley is set to rejoin his former Tyco BMW team for this year's North West 200. Ian Hutchinson has already signed to race for Tyco this season and Seeley, 37, is expected to be his team-mate. Seeley holds the record for number of wins at the North West with 17 and previously won a British Championship with Tyco. He will ride Gearlink Kawasaki bikes in the supersport races at the North West 200 which takes place from 8-13 May. The Northern Irishman parted company with the Briggs Construction BMW outfit at the end of last year's British Superbike campaign. Meanwhile, Michael Dunlop will ride a MacAdoo Supertwin bike at this year's Isle of Man TT. Ballymoney rider Dunlop and James Cowton will both be aboard the Cookstown-based team's new Kawasaki Z650 Ninja SuperTwin in the Lightweight TT Race on Wednesday 7 June. 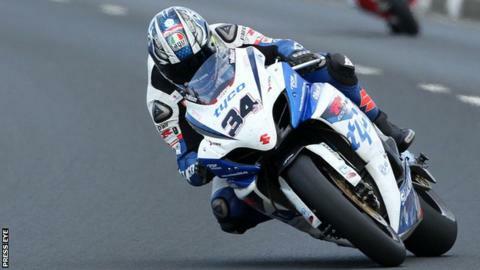 Dunlop set a TT Supertwin lap record at last year's Isle of Man meeting. The bike will be run in conjunction with MSS Performance who are currently preparing the bike at their workshops in Colchester. "We are thrilled to have Michael race in McAdoo colours again - a man we believe is the number one road racer in the world," said team boss Jason McAdoo. Last week, it was announced that Dunlop will compete in the Superbike classes in this year's international road races for the Bennetts Suzuki team.